Inspired by the Ancient Egyptian god Horus, the Secrets of Horus is a simple and easy to understand five reel and three row slot game. There is the option of between one and 20 active paylines, one and four bet levels and five separate coin values worth between 2p and 50p. The game’s theoretical return to player percentage is 96.0% and gameplay includes scatter wins, free spins and wild substitutions. The Secrets of Horus is one of the most simple and straightforward slot games around but there are still a few things which players will want to know before they start playing. These include details of the game’s top jackpot, its special symbols, its paytable and its betting limits, and all of these will be covered in detail below. The way in which players can win when playing Secrets of Horus is the same as all traditional slots, and involves hoping that winning combinations line up from left to right along an active payline. By far the most valuable possible combination is that made up of five Wild symbols, which pays at a rate of 10,000 times the bet level. That means that at the maximum bet level of four, the five Wild combination pays out a total of 40,000 coins per payline. In Secrets of Horus, however, Wild wins are automatically doubled, which increases the jackpot to 80,000 coins and if the win occurs during free spins it is also trebled. That makes the ultimate top jackpot a very large 240,000 coins andat the highest possible coin value of 50p, therefore, that payline jackpot is worth a total of £120,000. All of the Secrets of Horus symbols are themed around Ancient Egypt, and amongst them are also two symbols with special features. Those special symbols are the Wild symbol and the Scatter symbol, and both work in different ways to potentially increase the amount a player can win through the slot. Wild Symbol – the Wild symbol substitutes for all other symbols apart from the Scatter symbol and always goes towards making up the most valuable possible combination for any payline. As an added bonus, too, any wins in Secrets of Horus which involve a Wild symbol are automatically doubled. 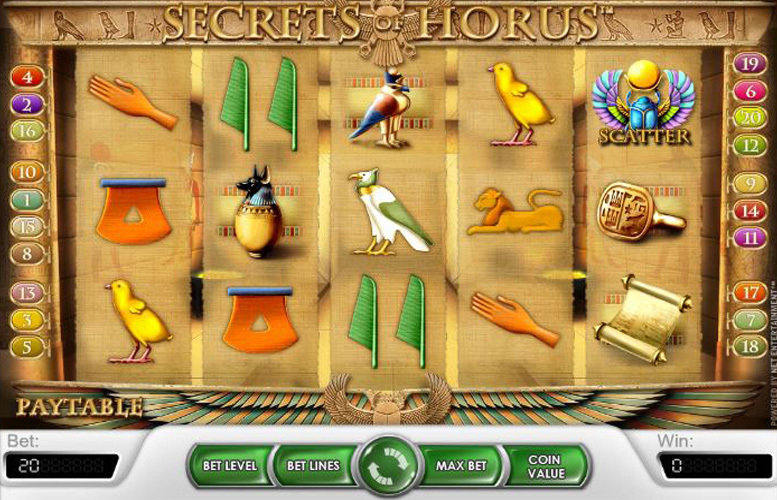 Scatter Symbol – scatter symbols within Secrets of Horus are those symbols which trigger the game’s free spins, and if three or more of them appear on the reels, a total of 15 free spins are awarded. These free spins are played at the same bet level and coin value as the spin which triggered them, and with the same number of active paylines. Additional free spins can still be won during free spins themselves and all free spin wins are trebled. The most valuable symbol in Secrets of Horus is the game’s wild symbol which, as well as enacting Wild substitutions, also pays out at a rate of 10,000 times the bet level if five of them line up along a payline. Wild wins in Secrets of Horus are also worth double, which means that the top payline jackpot can equal a total of 80,000 coins at the highest possible bet level. If the x3 free spin multiplier is also applied, therefore, a very impressive 240,000 coin jackpot can be achieved. Behind the Wild symbol, the next most lucrative symbol in the game is that which displays the Eye of Horus. Five of those symbols in combination are worth 750 times the bet level to any player and can therefore pay a total of 3,000 coins per payline at the highest bet level. What’s more, if the combination is achieved using a Wild, the winnings are doubled to 6,000 coins and if it occurs during free spins, that is subsequently trebled to make it up to 18,000 coins. There are three separate ways in which players can alter the amount they bet per spin in Secrets of Horus. They can choose anywhere between one and 20 active paylines, between one and four bet levels and between five different coin values from 2p to 50p. A minimum stake of just 2p can be achieved, therefore, by choosing one active payline, bet level one and a coin value of 2p. A maximum stake of £40 can be achieved, on the other hand, by setting the maximum 20 active paylines, top bet level of four and coin value of 50p. 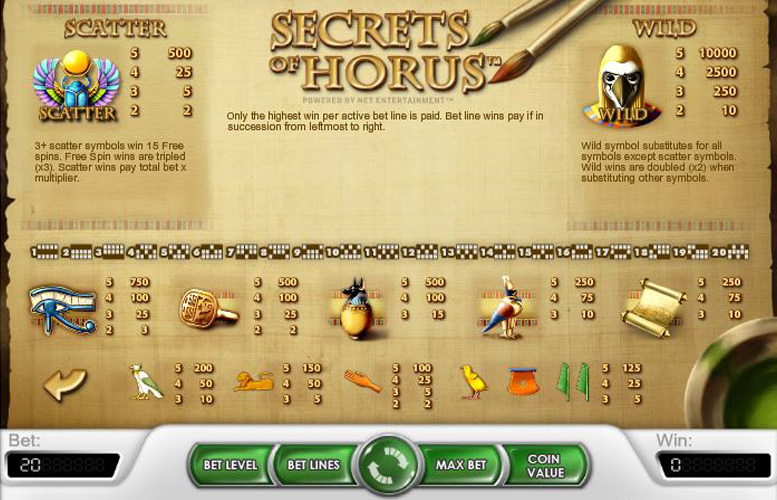 The Secrets of Horus is the perfect slot game option for any player who is looking for a really simple game that they can grasp straight away and play without having to give it too much attention. The game’s Ancient Egypt theme allows it to introduce attractive imagery and symbols and the use of free spins and wild substitutions, which both also have multipliers attached, enhance the potential jackpots of the game to a really impressive level. Those free spins and wild substitutions are the only additional features of the slot, however, and that may disappoint players looking for more immersive gameplay. What won’t disappoint, though, is the level of control that the game offers over stake amounts, which is up there with the very best around. This game has a rating of 3 / 5 with 3 total reviews by the users.